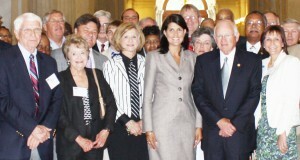 More than 40 mayors from cities and towns across the state met with Governor Nikki Haley to offer their hand as partners in the state’s economic development efforts. Mayors from big cities to small towns, including Latta Mayor Nancy Brigman and Lake View Mayor Robert “Temp” Smith gathered in the governor’s office to hear her priorities for the year, ask questions and offer their help to the governor in bringing businesses and jobs to their regions and state. Orangeburg Mayor Paul Miller, president of the Municipal Association of SC, led the delegation of mayors and stressed to Governor Haley that the state’s cities and towns represent the hubs of economic growth and future prosperity of South Carolina. “We as mayors serve the same constituents you do and have the same goals in mind – to bring good jobs and provide a high quality of life so businesses will want to come to and remain in our state,” Miller said to the governor on behalf of the mayors.